Sophia Perlman, performing October 19 at Artword Artbar. Photo by Tracey Nolan taken from http://www.sophiaperlman.com. It’s finally here! 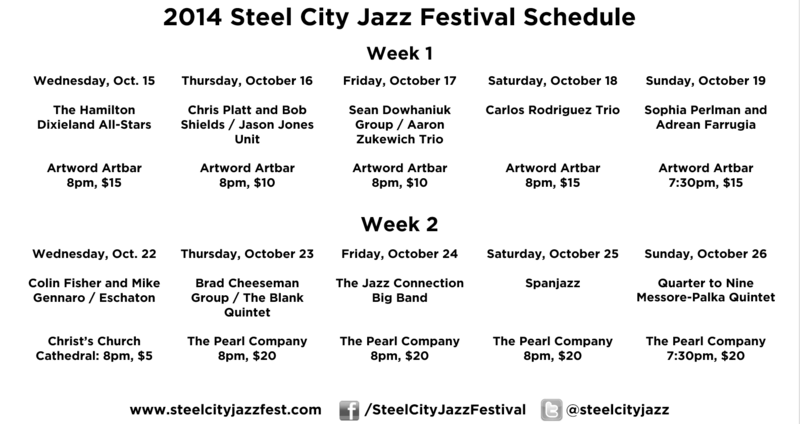 Below is the full schedule for the 2014 Steel City Jazz Festival. We have ten nights of amazing music planned for you. The festival kicks off October 15th with a performance by the Hamilton Dixieland All-Stars and continues through the weekend at Artword Artbar, featuring the talents of Sophia Perlman, Adrean Farrugia, Carlos Rodriguez, Bob Shields and many more. Our second weekend moves to the Pearl Company with a lineup including the Jazz Connection Big Band, the Brad Cheeseman Group, Spanjazz (featuring the Pearl’s own Gary Santucci on guitar), Quarter to Nine, plus many others. Thanks so much to those who helped put this lineup together and the fantastic artists who will be performing. Feel free to check out the Artists section of our website for more information on the musicians involved. I hope to see you at the shows! Next Next post: The 2014 poster is here!